English has a verb to box, meaning ‘to put in a box’. A set of things which has been put in a box is therefore a boxed set. 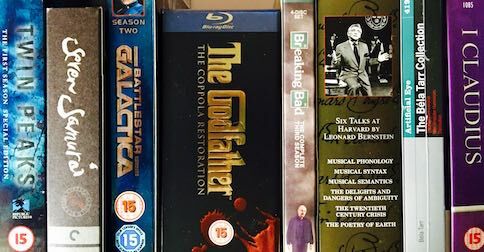 Obviously sets of things have been put in boxes for a long time, but the concept has grown in recent decades, with the boxing of paperbacks, records, audiocassettes, videotapes, CDs, DVDs and Blu-ray Discs, and has been boosted further by the rise of the multi-season TV saga. Now such sets can be accessed in e-formats with no physical box at all. It also gives us box’ set. This in turn can be interpreted as a compound noun – the noun box compounded with the noun set – rather than the noun set modified by the participle boxed. The British, in fact, have taken to writing the term as a compound, box set, something which Americans seem to have resisted. The only /t/ in those recordings is from the last of the Britons. Could the early primary stress on AmE boxed set be because the term has taken on a new meaning? Yes, compounds are associated with 1. early stress 2. some extra specificity in the meaning that isn’t predictable from the component words (eg box office). 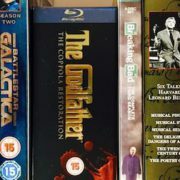 The term is coming to mean a ‘collection of episodes, films, albums, etc’ rather than something with a physical box. But that’s why it’s odd that Americans prefer to write it as participle + noun, while Brits are happy to write it as a compound! I would expect the reverse. Your blog has just reminded me of a university friend who (around 1980) pronounced mixed nuts as mikkusudonattsu when he was speaking Japanese. I immediately thought of mixed doughnuts, but later when we got to the department store to buy them, I realized that he had meant mixed nuts. Wonderful. He would have been helped a little by knowing about /t/-deletion. By the way, I think some people refer to mixed drinks as mix drinks.